The active ingredient in Frontline Top Spot is called "fipronil." It's a topical flea insecticide that works by getting into the oils of your cat's skin and hair follicles. It kills adult fleas and many types of ticks in cats and kittens, including deer ticks, which is the major carrier of Lyme disease. This flea eliminator works by killing newly hatched adult fleas before they have a chance to lay flea eggs. This breaks the flea life cycle and helps get rid of all fleas. Fipronil continues to work even if your cat gets wet or is exposed to sunlight. This flea medicine kills fleas shortly after the parasite comes into contact with your cat's skin. There is no need for it to bite your cat for it to work. This insecticide kills fleas and ticks for at least one month. According to the product label at the manufacturer's web site, Top Spot can be used on kittens 12 weeks and older. This is a little strange, since the product label for Frontline Plus says not to use on kittens under 8 weeks of age. It's probably safest to consult your veterinarian when using any Frontline product for kittens, or use Advantage Flea Control, which is safe for kittens as young as 8 weeks old. The area where you apply this flea killer may appear wet or oily for up to 24 hours after application. This is normal, but don't touch the area until dry. Frontline flea control products are now available without a prescription. 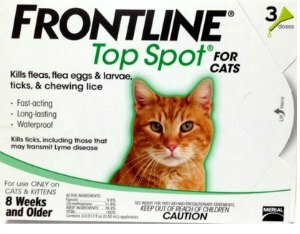 You can buy Frontline Top Spot in 3, 6, and 12 dose packages directly from many pet supplies stores and discount pet supplies stores online. Amazon carries this flea medication and all the other popular flea control medications at a steep discount. Only Natural Pet Store is my #1 recommendation for natural flea control products. If you decide to go natural, this is the place to go.